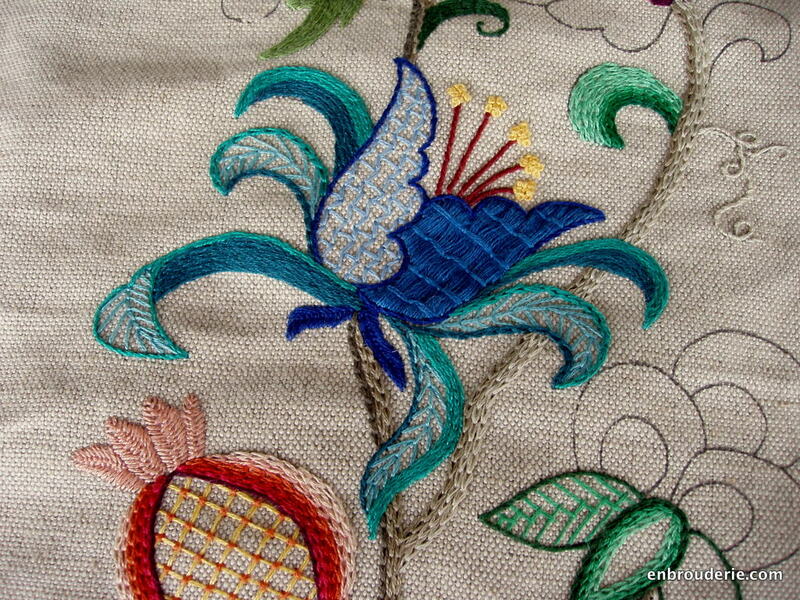 Anyway, I finished another flower in the Plas Teg Bellpull (from the Mary Jane Collection). It’s the central blue flower, and I really like the finished effect. All that stem stitch filling got a little tiring, so I threw in some additional fly stitch (the middle two sepals already had it). Also, it’s been a while since I posted a photo of the whole piece, so here it is. This entry was posted in Crewel, My work and tagged bellpull, crewel, embroidery, Mary Jane Collection, plas teg bellpull. Bookmark the permalink. You know, it’s never too late to start! Now there are even video tutorials (see Mary Corbet’s site Needle’n’Thread at http://www.needlenthread.com/videos), so you can have a teacher any time you need one. Your work is beautiful. Inspires me to try crewel again. glad to hear it! Crewel can be so much fun. Your piece is exquisite, the colors are magnificent, you are such a talented lady, Thank you for sharing your lovely work. Stem stitch filling does go on a bit, doesn’t it – but the lacy fly stitch you’ve added also fits nicely – well done! I love to embroider, but cannot find kits anymore like we used to. I used to embroider a lot of Elsa Williams, two years ago finally finished stitching her masterpiece “Merton.” It is beautiful,,I think. Where do you buy your pieces to embroider? If you are looking for a particular style, just let me know – I haven’t posted about all the shops I’ve found (usually I stick to ones I’ve bought from) but would be happy to come up with a list. Google Image Search is also great for finding things.